Hishio, the Centre for Cultural Exchange opened in June 2005 in the historic town of Katsuyama, Okayama prefecture, Japan. It was the passion and endeavor of local people that lead to the completion of Hishio on the site of an old soy-sauce factory owned by the Kiyotomo family. The soy-sauce business was founded in 1868 and the Maruni brand was loved by local people for more than a hundred years until the factory was finally closed in 1972. The brewery building, the Shoyu Kura, stood vacant for decades and became a concern for those who wanted to save the beautiful buildings from decay. In 2000, came the news that the Kura was to be donated to Katsuyama town by the Kiyotomo family on condition that it would be used for cultural purposes. 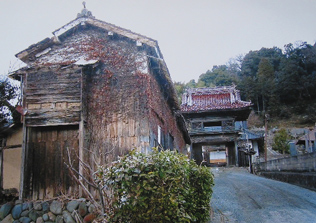 This lead to the Katsyama Machinami Iinkai being set up and it was through this group, with the aid of a government grant, that plans were drawn up for the building’s rebirth as Hishio. Katsuyama was once a prosperous town bustling with people as a major stopping place on the Izumo Kaido, an old road connecting the Japan Sea and the Inland Sea. Flat-bottomed boats called Takasebune transported goods on the Asahi River which runs through the town and in this vibrant community, both merchandise and culture were exchanged. Much has changed since then. Like many small towns and villages in rural Japan, Katsuyama went into decline in the modern age. But in recent years the town has been experiencing a remarkable rejuvenation thanks to the enterprise and imagination of its people. The old buildings have been restored to their former beauty, and the streets are adorned with Noren, colourful door curtains designed and dyed by a local artist using traditional techniques. In March the whole town gets involved in the Girls’ Festival, which draws huge crowds to the traditional and contemporary displays of dolls, set out for the occasion by the whole community. Many people who have left katsuyama to live in other parts of Japan return in the Autumn for the fesival, which is famous for its fighting floats.